Vistaprint: 30 personalized Valentine’s Day cards for FREE! You are here: Home / photo deals / Vistaprint: 30 personalized Valentine’s Day cards for FREE! I can’t believe that Valentine’s Day is only 2 weeks away! 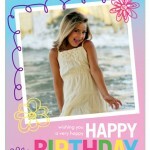 Vistaprint has an awesome offer right now that makes creating Valentine’s Day cards for your kids simple and fun! Get 30 personalized Valentine’s Day cards for FREE! All you pay is shipping, which is about $4 for 30 cards! You can choose up to 3 different images! Don’t forget to order extras for grandparents and cousins! Click here to take advantage of this offer–> Vistaprint 30 personalized Valentine’s Day cards for FREE! This offer is valid until 2/1/13! NOTE: This offer is for 10 cards, but each card contains 3 smaller cards, which is where the “30” comes in! Shutterfly 10 FREE photo cards! 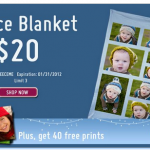 GIFTS FOR GRANDPARENTS: Personalized fleece blanket only $20! 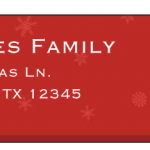 140 FREE Holiday Address Labels or Gift Tags from VistaPrint! 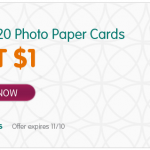 HOT DEAL ALERT: 10 holiday photo cards for $1! Vistaprint: Free holiday address labels or gift tags!